Three is the magic number for people under stress. 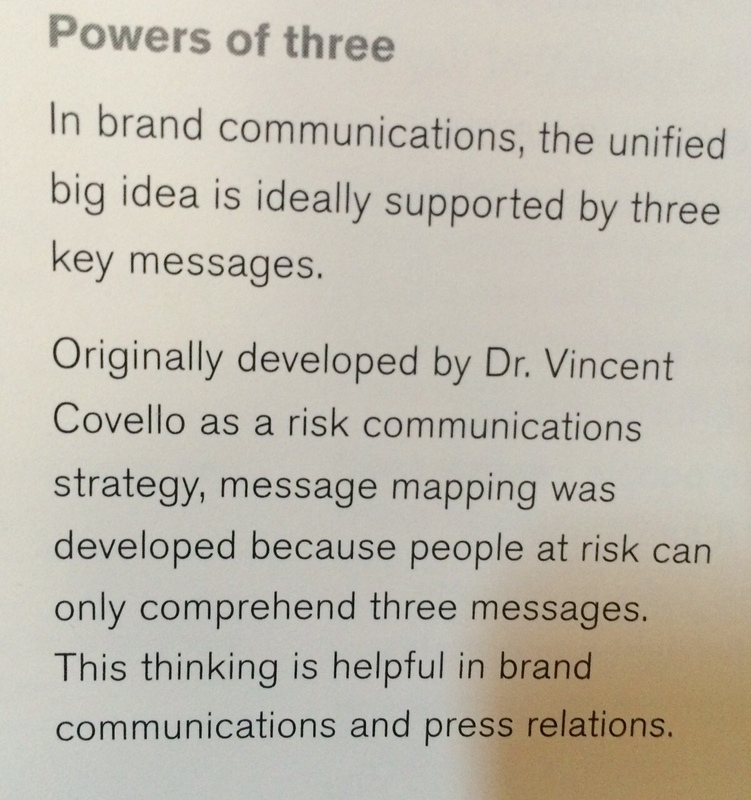 That’s according to risk communication expert Vincent Covello. 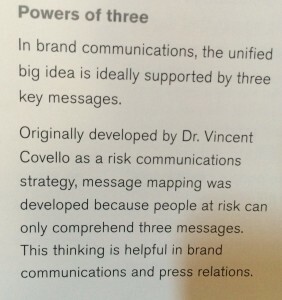 Covello, director of the Center for Risk Communication, said there actually are three magic numbers—27/9/3. That translates into 27 words, nine seconds, three messages. He advised state leaders to prepare their messages with the 27/9/3 principle. “If you don’t keep it short and simple, someone else will make it short and simple for you,” he said. Winning search for your name is a great personal branding achievement, especially if you have an uncommon name. Having a unique name like Erik Deckers is a no-brainer. Toss up a blog, a Twitter account, and your LinkedIn page, and you’re all set. Just make sure to keep your social media footprint clean, and you’ll clean up whenever someone Google’s your name. But what if you have a name that isn’t unique, but also isn’t common (i.e. not John or Chris Smith; sorry guys. It’s never going to happen for you). Or what if you have a unique name, but you want it to be associated with a specific niche or keyword, like writing or woodworking or marble collecting? Here are three expert-level techniques you can use to associate your name with that special keyword? 1) Create Twitter lists with your name and keyword. Google loves Twitter lists, and you can give yourself some search engine juice by creating a list based on your name and a specific keyword. While you’re at it, go to Twylah.com and claim your account there. I’ve had some good luck getting my Twylah page show up on Google once in a while. 2) Use your name in title tags of backlinks. When you create backlinks to your website or blog, you want to hyperlink only those words you want to be known for. You should never link an entire sentence or the words “click here.” But if you can’t escape that, you can still tell the search engines that link is actually about something else, like your name. This link may be to the phrase “ghost blogging,” but it tells Google that the link is actually about my name and the fact that I’m a professional blogger. Note: You do need to know a little html code to pull this one off, but only a little. Basically, if you can remember <a href=”URL” title=”TITLE”>, you’ll be all set. YouTube is still a rich source of Google juice that can be squeezed and squeezed. If you create solid videos with good content, and don’t become a spammer, you can get some great video SEO about your chosen topic. Create 2 – three-minute video lessons about your chosen topic. If you’re a writer, record a Camtasia video about a specific writing technique. If you are a computer trouble shooter, create a video about how to fix a particular problem. Embed these videos on your blog, and paste in a written transcript both on the video site and in the blog post. Make sure you use your keyword phrase in the title of the video and blog post, as well as a few times within the transcript. These are some of the secrets that the social media experts are using to get their own personal brands found more easily online. By using any or all of these, you can help your own brand be found, especially by prospective clients or employers.